Bringing together leading researchers from geography, political science, sociology, public policy and technology studies, Disrupted Cities exposes the politics of well-known disruptions such as devastation of New Orleans in 2005, the global SARS outbreak in 2002-3, and the great power collapse in the North Eastern US in 2003. But the book also excavates the politics of more hidden disruptions: the clogging of city sewers with fat; the day-to-day infrastructural collapses which dominate urban life in much of the global south; the deliberate devastation of urban infrastructure by state militaries; and the ways in which alleged threats of infrastructural disruption have been used to radically reorganize cities as part of the ‘war on terror’. 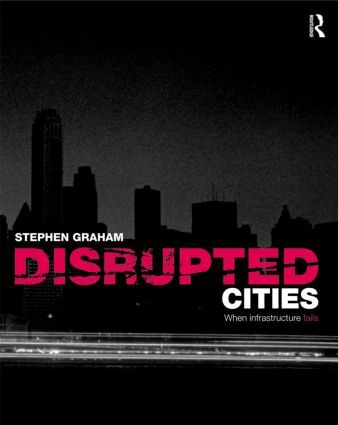 Accessible, topical and state-of-the art, Disrupted Cities will be required reading for anyone interested in the intersections of technology, security and urban life as we plunge headlong into this quintessentially urban century. The book’s blend of cutting-edge theory with visceral events means that it will be particularly useful for illuminating urban courses within geography, sociology, planning, anthropology, political science, public policy, architecture and technology studies.